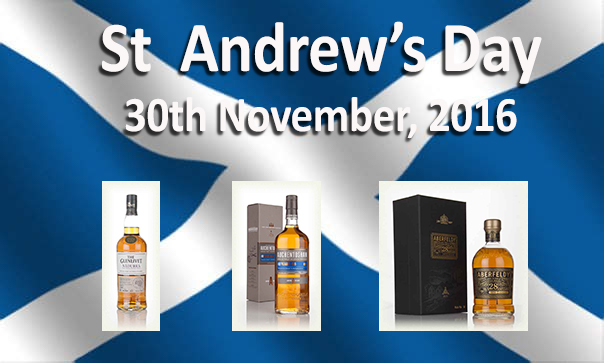 Whisky and St Andrew's Day :: Wednesday 30th November, 2016 :: Which whisky should I have on this Scottish special day? St Andrew's Day is an important day to all Scottish people home and abroad, and we should celebrate this day the same as Robert Burn’s Day where every January thousands of Scottish people toast the Bard. St Andrew's Day should be celebrated with a good whisky, bagpipes and traditional Scottish food. St Andrew's Day falls on Wednesday 30 November, 2016 and sometimes you feel it is celebrated more out with Scotland than within its Scottish "Borders". There are many whiskies that we all enjoy, but what whisky is right for you on Scotland's special day? Some people just like having the traditional whiskies like Bells or Famous Grouse as they toast Scotland’s patron saint which are both excellent, but I always feel a particular dram should be consumed on St Andrew's Day. Below is a list of drams for St Andrew's Day that could make your day even more special. The Glenlivet Nàdurra is the perfect way to celebrate ‘2013 The Year Of Natural Scotland.’ It’s inspiration comes from the wild and remote location of the Livet Valley. The 16 year old single malt is matured in first-fill ex-bourbon casks and bottled at full strength. The whisky reflects the spirit of the glen, unfettered and unspoilt. Available from Master of Malt for for £40.45. To buy this Glenlivet whisky click here. Chivas 12 Year Old ‘Made for Gentlemen’ is an annual series of collaborations with modern craftsmen who share passion for style, heritage and creativity. Chivas deluxe scotch whisky has collaborated with Patrick Grant, Creative Director and Owner of bespoke tailors Norton & Sons of Savile Row, to design the second limited edition for the series. Available from Waitrose for £27.49 for click here to buy online for £25.67. View uther Chivas 12 YO with price ranges between £200 and £25.67. Another excellent choice would be the Scottish Highlands malt - Aberfeldy 28 Year Old Single Malt Whisky Single Malt Whisky. If you would like to buy this malt online click here as it is available for £169.93. One of the best Lowlands distilleries is Auchentoshan and their Auchentoshan 18 Year Old Single Malt Whisky would be an ideal choice for St Andrews day. This malt is matured in American oak casks. Click here for more details and to buy online. Cost of this bottle is £75.79. Devil's Punch Bowl III is another excellent choice with its lovely flavours throughout. As tasting this malt goes you will be able to sense of vanilla and cinnamon, followed by wine-like sweetness and developing floral hints. Hints of pepper and orange peel. So many of the Arran malts are special and a number of them would be great for this day. To buy the Devil's Punch Bowl III online click here. Cost price £199.95. Laphroaig Quarter Cask is another favourite of mine for St Andrew's Day as you sense the rush of peaty smoke when consuming this excellent whisky. There are also hits of sea spay, bananas with a long smoky finish. Click to buy this malt online. Bottle price is £39.11. << View Single Malts from Laphroaig Distillery range. There are many others you can choice from and if you would like to see more visit our Scottish Single Malts pages or Blended whisky pages. Also do not forget about have a lovely grain whisky for this special day.